4 F 4 3rd fretfr. optionalopt. 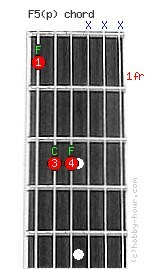 F5 power chord's notes: F, C and F. Only the 6th, 5th and 4th strings can be played. The note F on string four is optional. F5 (perfect fifth interval) power chord's alternative names: F(no 3rd), F(no3).